We're WILD About Giraffe Prints!! Of course, we love animal prints here at Cutie Pie Bows!! And we're WILD about our new giraffe print bows. You will fall in love with them and if you're like me, you'll go out and find an outfit to match the bow (hint, hint: Kohls) instead of the other way around!! Choose from a variety of sizes and styles. Here's a sneak peak of just a few we offer. Check out our other animal print bows and accessories. You won't be able to resist them! Our newest creation is SUPER CUTE!! This was a custom order for a Supergirl birthday party and it is absolutely adorable! Let us create a custom bow for your special occasion!! 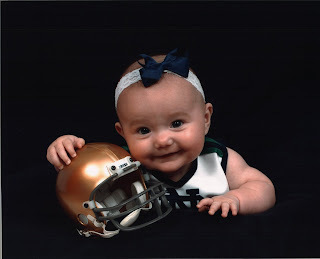 With my husband's birthday just around the corner, I thought it would be fun to get Kendyl's pictures taken again in her Notre Dame paraphernalia especially since the last time we did that was when she was 5 months old (top picture)! It's still his favorite picture to date and still sits on his desk at work up front and center stage!! He always says that he'll keep that picture forever!! Pictures make great gifts for the daddy, grandpa, grandma or mommy that has everything! And a gift they will keep forever!! Get your custom bow made to match your alma mater, favorite sports team or school!! And don't forget to enter to win a $20 Gift Certificate to be redeemed at http://www.cutiepiebows.com/!!! Just click here http://cutiepiebows.com/contact.php and enter your name, email address and in the Comments section, enter GIVEAWAY. That's all there is to it to be entered in our contest. We'll randomly pick a winner on Friday, July 3, 2009. 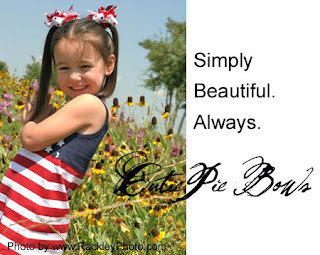 Enter to win a $20 Gift Certificate to be redeemed at http://www.cutiepiebows.com/!!! Just click here http://cutiepiebows.com/contact.php and enter your name, email address and in the Comments section, enter GIVEAWAY. That's all there is to it to be entered in our contest. We'll randomly pick a winner on Friday, July 3, 2009. Our FREE Monogram Initial Hair Bow Special Offer is here again with $30 purchase (not including shipping). 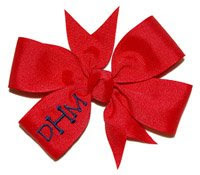 You design your own hair bow -- select the size (medium or large hair bow), ribbon color, monogram color and font style!! Offer expires 7/01/09. We now have a FAN page on FACEBOOK for all of our wonderful customers!! Become a FAN and you will recieve Facebook only specials. Tell all your friends to join too!! We hope to see you on Facebook!! Looking for the perfect baby shower gift for a hip and chic mom? Look no further!! The First Haircut Itty Bitty Clippies make a great baby shower gift to give along with a Monogrammed Hair Bow or Personalized Name Hair Bow and Carter's First Friends Stacked Trinket Boxes (First Curl) http://www.baby-memory-books.com/Carter_s_First_Friends_Stacked_Trinket_Boxes_p/gwc-57-0081.htm available at Babysakes.com. New Enchanted Pink & Brown Itty Bitty Hair Clippy 3-Pack now available online at http://cutiepiebows.com/catalog.php?category=142. These adorable clippies are perfect for your trendy little princess! Our new line of Itty Bitty Clippies are flying off the shelves here at Cutie Pie Bows!! They are a huge hit so we are constantly expanding our line to include new colors and patterns. Today we added new Solid Color Itty Bitty Clippies - you choose the color you want. Also newly added are the Crochet Flower Itty Bitty Clippy and Pink & Black Argyle Clippy -- so adorable!! They are 1.75 inches in length and perfect for any age!! You will fall in love with our new Disney Princess Bows we added to our If The Tiara Fits Princess Collection. They are truly magical!! We have Cinderella, Belle, Ariel and Sleeping Beauty bows to choose from. They are perfect for your upcoming trip to Disney World, dress up, birthday parties or everyday wear!! Who is your favorite princess? Get yours now!! These are too cute to wait another second to share with the world! We have our new line of designer Pony O's and Itty Bitty Clippies available now! We have a dozen more styles that will be added to the website soon so keep checking back. These absolutely adorable sets can be used together, separately or for matching Big Sis and Little Sis. The Itty Bitty Clippies are all the rage right now. They can be used by babies with the finest of hair or for older girls to keep the wispies pulled back. I personally love to use them for wispies and pair them with my favorite bows!! Trendy, posh, exquisite accessories for the perfectly put together little girl!! As always, they make great gifts for the girl who has everything! And the perfect gift that a hip and chic mom will love for her little princess!! We went to paint pottery today to make daddy a father's day gift. We went to Ceramics By Tess (http://www.ceramicsbytess.com/). They have a variety of pottery to paint -- plates, bowls, picture frames, ornaments and much much more. You can leave your pottery there for about a week to have it glazed or the kids can get them sprayed with gloss and glitter and take it home that very day. It's an inexpensive way to have tons of fun. Kendyl is wearing the Paint Splat Craft Apron to protect her clothing. It's so cute and is for boys and girls!! Last day for our "SWEET" deal!! Read on to find out! Sport Bows are a "HIT!" We had our last T-Ball game and T-Ball party on Saturday. It was so much fun and we were so sad the season was over (and by "we", I mean daddy). Kendyl wore her embroidered Mets bow to the party and it was a "hit." Pesonalized Hair Bows are so popular and make your team or group really stand out! We do large group orders for sororities and sports teams all year long available in a variety of styles. Here are just a few to pick from http://cutiepiebows.com/catalog.php?category=36. We can also customize a bow for you and your team! Just email us at info@cutiepiebows.com! Custom Bow for State Champions!! Let us create a custom championship bow for you! What a great keepsake and perfect for team pictures! You'll flip over our new Flip Flops! Our flip flops are the hottest selling item this summer! We can't keep them in stock! So here are 2 of our newest flip flops! Get them fast before they're gone!! This is a just a sample of our new line of dresses coming soon! We don't have an exact date as to when we will be launching our new clothing line that will be called Kendyl's Kloset, but expect it sometime this year. The dresses are absolutely adorable! And they have matching button pony O's that just top it off! So exciting! You would have certainly mistaken Kendyl for a watermelon today! But I have to say she looked sooooooooooooo stinkin' cute! We had a girls day today and got manis and pedis and everyone loved the Watermelon Picnic bow - the poor girl couldn't get any peace and relax because everyone was mesmerized by her bow (heehee)! 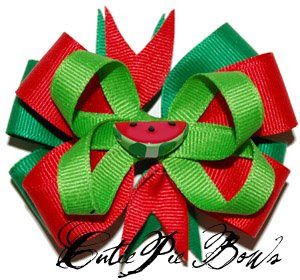 I can't wait to make more watermelon bows to match this line. Keep reading for a SWEET surprise!! 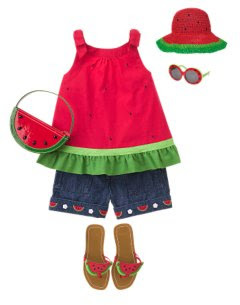 We're in LOVE with the new Watermelon Picnic line at Gymboree. It's so cute, I can barely stand it!! I went crazy and bought everything! Kendyl is going to look like a watermelon for a while - literally from her head to her toes!! Here's a sneak peak at the M2M Gymboree Watermelon Picnic and Watermelon Girl Bows. Use Discount Coupon Watermelon (in the shopping cart) to save 10% off your entire order at http://www.cutiepiebows.com/. Offer expires June 8, 2009. 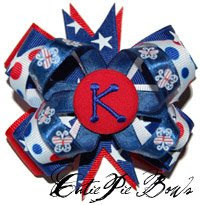 Check out some of our new 4th of July and Patriotic Bows - they are so cute!